I teach playwriting and dramatic literature at Webster University in St. Louis. My latest play Honor Student was selected for development by The Tennessee Rep in 2013 as part of their playwrights in residence program. It won several national awards. My short story, Snow Geese, was selected as a finalist for Zoetrope All Story’s 2014 Short Fiction Contest, judged by Ben Fountain. It was also a finalist for the John Steinbeck Fiction Award and will be published by Reed Magazine in Spring 2015. 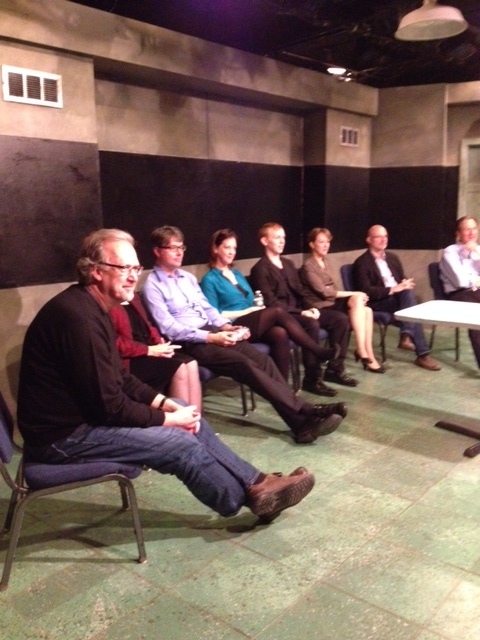 Here I am with the director and actors of Honor Student during a post-play discussion at the T. Schreiber Studio, New York, NY, December 8, 2013. The reading was arranged by Playwrights First, a project of the National Arts Club which selected Honor Student as the winning play in their 2013 contest.